Efficiency is something that we wish to avail not just on professional grounds, but even also on the personal front. With every changing technology and constant introduction of new innovations, it will not be wrong to commit that technology has created a huge impact on both sides of coins of our lives. While for some, the modern day smartphone is the easiest way to reach their eventual goals, for few its a device that can distract you while working. But the truth is that with proper discipline and efforts, technology can be used to work more effectively in all aspects of lives. Be it your home, office, school, college, meeting a doctor, bringing in grocery, or any other thing, if you follow it the right way then technology can help everyday processes to be streamlined and hence increase the efficiency. So, if you are still not able to figure out the proper ways of using technology to work more effectively in various spheres of life, then here we present you the best ways to use technology. With these ways, you will not increase your productivity, but will also learn to streamline things using technology and eventually reach your final goals in a hassle-free manner. The very aspect to consider while using any technological device is to employ the right type of technology. This decision greatly impacts that whether the technology is a boon or a curse to your productivity. Just analyze the area of your life where you wish to use the technology and identify that if the tool is appropriate to fill the gap or not. One easy way to use technology to work more effectively is to switch to tools that can automate everything. Whether you need to pay your bill or need to schedule an appointment or update your contact list, if you have that one perfect tool that can automatically do all such tasks then think how wonderful it would be! Using automation tools will reduce all your efforts to more than half and will offer you an easy way to digitize processes that you are doing manually. This will make everything so effortless for you and will surely enhance your overall productivity. No need to depend totally on technology. I don’t want you to just become a rusted machine. Rather use technology for carrying transactions and in areas where you need them the most. For example, rather than going to the grocery store or getting milk from the dairy, you can always rely on your mobile apps to get necessary things right at your door. In another example, you can use elements like Headspace and Evernote to keep a track record of your stuff, which most of the time you need to do writing on a pad or a page. Presently, there is a promising technological solution to almost every problem. So, just select the areas where you need technology the most and you will get time to focus on more important things and increase your efficiency. Everyone wishes to get more tasks done in less time. This is the truth. One of the best ways for this is to use Chrome extensions that allow you to access things faster. There are multiple chrome extensions available online that have been designed to add ease to your everyday work, particularly on the professional front. Using such extensions is very easy and moreover, you will considerably save lots of time. So, if you want to know an easy solution to increase your productivity, then this is one of the best ways. 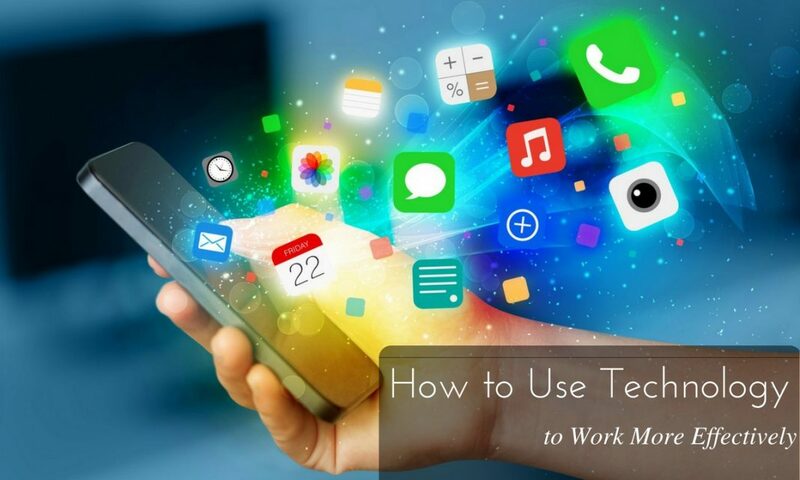 If you are not able to identify the best way to use technology to work more effectively, then this one is just perfect for you. No need to stick to too many apps or devices. All you need to do is to use the latest calendar app for organizing your stuff. You can use these apps to get reminders for important things, numbers, events, meetings, and other schedules. If all such data is saved in the app, then your mind will have lots of free space to do other important things. This way you will not just be able to do all things on time, but will also be able to obtain increased productivity. From the customer point of view, free applications are always welcomed and the pocket-friendly way to meet more solutions at less cost. So, wait no more. Take benefit of the free applications to make your life more efficient! Grocery apps, home electronics monitoring apps, pickup and drop cab apps, and other such applications are just a few examples that charge no money to install and offer service for free of cost. You only have to pay for the products or services which you will use, like the grocery you purchase, or the cab fare. It is true that workflow yields and automation of procedures can lead to greater efficiency. But this may work only if you use it intelligently and precisely. Hence, make sure that you don’t use too much of technologies and devices on one hand. This might make you confused and land up in a situation where everything is messed. Just be thoughtful, decisive, and intelligent while making an appropriate decision so that you don’t end up in a troublesome situation, which is the case with most of the individuals out there. The best way to increase your efficiency with technology is, to begin with, an easy-to-use technological plug-in or device. The easiest way is to begin optimizing the existing programs. For example, you can use Boomerang for your Outlook emails and reminder system. This tool will help you to manage your Outlook in a better way and to clean up the inbox by archiving the vital messages and bringing them when you require them. Another way to use technology for better productivity is to get uninterrupted access to data and information. You can develop a reliable and secure network on the basis of intelligent routers and let all your employees access that information. This will ensure that the members of your organization are always aware of challenges and changes that need to be done and to react instantly to external changes. If you are a person who travels a lot and wants to keep in touch with your employees, customers, and other related professionals, then using video-conferencing is a great technique. This is a way to give them a level of personal service that they must be expecting from you. At the same time, you can communicate with anyone and from anywhere without actually reaching to them virtually. With this technology, you can talk to your client and other professionals via PC and have a face-to-face conversation with ease. These days the customers have become more demanding than ever. All they demand is timely and round-the-clock service for all sorts of products and services. The best way to fulfill this request is to create a website that offers the option of FAQs, forums, comments, feedback, and others. Your website will act as a direct tool of communication between you and your customers. The best thing about creating a website is that, it can be built at very competitive prices and can also serve you as a platform to showcase your offerings to your customers. Your sales and marketing team must be using a lot of materials and colorful brochures to promote your company’s products and offerings. This is a great expense to any organization. An efficient way to reduce such expenses is to use technology and to create a sales and product presentation that can be emailed to the clients. With a professional presentation comprising interactive pages, video clips, multimedia sound, and company’s information, it will be easier and cost-effective to present your offerings to the customers. Whether you need to reach to your office, or home, or any other place, you can always use technology to reach to your places at a very faster pace. Google Maps, Waze, Beat the Traffic are some of the applications that can help you identify the faster route to any location quickly. Such apps make traveling simpler and easier for you. Even using these apps can help you avoid stuck in traffic. Hence technology can be used to reach places faster and without experiencing issues. CloudOn, ActiveInbox, and Google Driver are some of the examples of technological advancements that can help you get your work done. These documents are created to help you get your work done seamlessly. Also, it is possible to share such documents across channels, thereby enhancing the overall communication within a team. The present scenario has altered completely and it is now time to get information and news faster than before. There are various multisource news platforms, like Newsy, Skimm, Instapaper, and Pocket that offer users to get access to a news right after few minutes of its happening. The news is produced in the shortest time frame of 2-3 minutes. Even these apps allow users to view streamlined videos of the incident. Few of these apps also allow users to mark and read the news later. The overall task of maintaining your budget might be time-consuming, but you can do it with ease via various mobile apps. There are numerous technological ways that can help keep your budget in check. From booking cheaper flights to hunting for a cost-effective event to selling old items in exchange for cash through Craiglist or getting your daily tasks done through TaskRabbit, all can be done with ease through technology. The only thing is to ensure that you use it in the right and appropriate way. There are numerous sites offering online reviews for every service, product, experience, or company. It is practically not possible to search for a review of each product or service. But with technology, it is possible! There are various online review sites, like Yelp that can offer you with the review about a product, service, company, and almost everything. So, you can use such websites to compare and analyze your preferred solutions. This way you will be able to save time and make the best decision. The time saved can be used on other vital products thereby enhancing your overall productivity. Technology turns into an excellent solution to maximize business productivity and to create an open and communicative environment. Even it helps to enhance visibility and support employees to avail updated information with ease. As a result, employees are able to understand better the changes or new amendments that eventually raise the productivity to a great extent. There are various online business managing software available that can be used in order to keep a close check on the goals and its accomplishments. With such software, it is very easy to track the progress of your business. As a result, you can stay more motivated, alert, and productive towards your work and accomplish the goals. Good health is always supportive of increasing efficiency. With different types of wearables and apps available, you can keep a check on your health and work towards maintaining it. This way, you will be able to avail higher efficiency at work. Hence, just set clear goals and then use a technology accordingly. Ultimately this will result in better efficiency, bigger achievements, and future success. Next articleHow to Use Google Alerts in Your Job Search Effectively?